Gastric bypass is surgery to help you lose weight if you’re very overweight. It works by making your stomach smaller and bypassing part of your intestines (bowels), so you absorb fewer calories. Gastric bypass can help you lose up to two-thirds of your excess weight within two years. You’ll usually only be considered for surgery if you’ve tried to lose weight in other ways and this hasn’t worked. But you may be offered a gastric bypass straightaway if you have a BMI of more than 50. You can work out your BMI using our BMI calculator. To be considered for a gastric bypass, you need to be fit enough to have an anaesthesic and surgery. You must also be committed to having long-term follow-up appointments and to follow your doctors’ instructions about your lifestyle and diet after your operation. To assess this, and your suitability for surgery, you’ll need to have a psychological assessment. Like all types of weight loss surgery, a gastric bypass isn’t generally recommended for children and young people. So, you must be over 18 to be able to have it. Even if you meet all of the above criteria, you may still not be able to have the procedure, due to high demand. 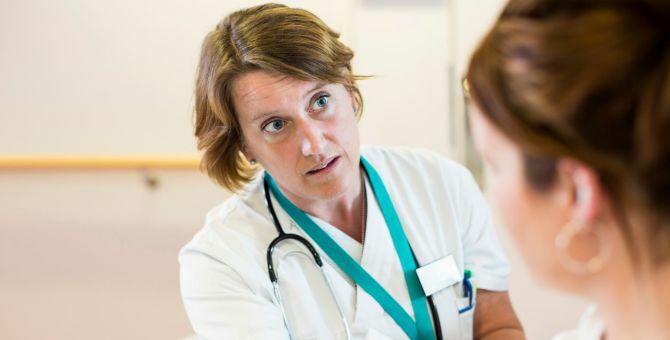 If your GP thinks you may benefit from surgery, they may refer you to a specialist weight management service to discuss the different options available. If you don’t meet the criteria for NHS funding, you may be able to have the surgery privately. Gastric bypass surgery is a major operation. It’s important to discuss the surgery with your doctor or bariatric surgeon, so you can make an informed decision about whether or not to go ahead. It may be helpful if you write a list of questions before you go for your appointment. It’s a good idea to bring your partner or a family member with you when you talk to your surgeon, so they’re also aware of what’s involved. There are lots of things to think about before you and your doctor decide whether gastric bypass surgery is right for you. If you have high blood pressure or type 2 diabetes, gastric bypass surgery can make these conditions better, or even make them clear up completely. Up to six in 10 people with diabetes who have a gastric bypass find their sugar levels go back to normal after six years. Weight loss surgery may also make joint problems and breathing disorders, such as sleep apnoea, better. If you have gastric bypass surgery, you’ll need at least two years of medical care and check-ups afterwards. You’ll also need to change your lifestyle, and what and how much you eat. You will need to take or be given vitamin and mineral supplements for the rest of your life. Some people are disappointed with how they look after their operation. This may be because they’ve been left with excess skin or had unrealistic expectations in the first place. Gastric bypass surgery can cause some serious complications. These can happen during and after the operation, and may mean you need more treatment or another operation. Some of the complications can be serious. See the section Complications for more information. Your surgeon will let you know if there’s anything you need to do to prepare for your operation. If you smoke, you’ll be asked to stop for at least eight weeks before the operation and permanently afterwards. This is because smoking makes you more likely to have complications during and after surgery. If you can, try to lose some weight before your surgery, as this will make the operation easier and mean you’re less likely to have complications afterwards. Your surgeon may ask you to follow a low-fat, low-carbohydrate diet for one week before your operation. This helps to shrink your liver, so your surgeon is more likely to do your operation using keyhole (laparoscopic) surgery. Having keyhole surgery means you’ll have less pain after the operation and will be likely to recover more quickly. If you’re taking any medicines (prescribed or bought from a pharmacy), it’s important to tell your surgeon before your operation. This includes non-steroidal anti-inflammatory medicines (eg ibuprofen or naproxen). Your surgeon may suggest you stop taking NSAIDs, or that you take them with medicines called proton pump inhibitors. This is because they can make you more likely to have a stomach ulcer afterwards. Before you go to the hospital for your operation, you may want to prepare for when you return home. If you live on your own, it may be a good idea to arrange for a relative or friend to help you during the first few days after your surgery. You’ll be admitted to hospital either the night before your gastric bypass, or on the same day. You’ll have the surgery under general anaesthesia, which means you’ll be asleep during the operation. You’ll be asked to follow fasting instructions before your operation. This means you won’t be able to eat, typically for about six hours beforehand. You’ll be able to drink water up to two hours before, but always follow your surgeon’s advice. At the hospital, your nurse will check your heart rate and blood pressure and test your urine. You’ll be asked to wear compression stockings on your legs. This will help prevent blood clots forming in the veins in your legs (deep vein thrombosis). You’ll also need to have an injection of an anti-clotting medicine as well as, or instead of, wearing compression stockings. Other types of surgery can help you lose excess weight by making your stomach smaller. These include gastric band and sleeve gastrectomy. Like gastric bypass surgery, you’ll also need to make changes to your diet and lifestyle long-term for them to be effective. Another option is to have a silicon balloon inflated in your stomach. This will make you feel full, but can only be used for short-term weight loss. Your surgeon will talk to you about the options available. This will help you to learn more about each type of surgery, and decide which one is best for you. 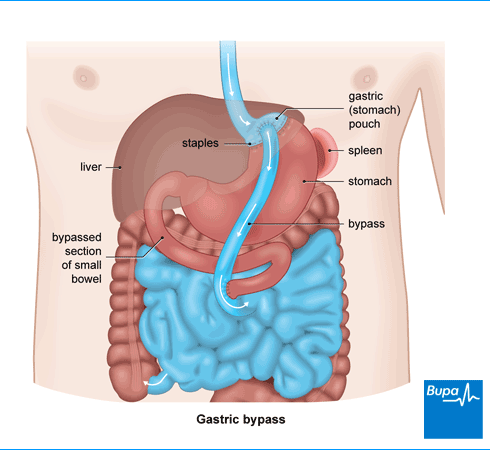 This is a general overview of what you can expect if you’re having a gastric bypass. But your operation may be different to this, depending on your surgeon and your individual circumstances. A gastric bypass operation usually takes between one and three hours. It’s usually done using keyhole surgery. This means your surgeon makes small cuts in your tummy rather than one large cut. During the operation, your surgeon uses small instruments, guided by a special telescope with a camera. Sometimes your surgeon may need to switch from keyhole surgery to open surgery during the procedure, if they think this is safer once they’ve started. But this won’t affect how much weight you lose afterwards. Using surgical staples, your surgeon will make a pouch out of the top of your stomach, separating it from the lower part. Your surgeon will make an opening in the pouch and connect it to a section of your small intestine. This means the food you eat won’t pass through the lower part of your old stomach or the first part of your bowel. During the operation, your surgeon will bypass a carefully selected amount of intestine. This means that when you reach the right weight, you’ll be able to absorb enough nutrients from your food to stay at that weight. Your surgeon will close your cuts with stitches or small metal clips, and place a dressing over your wounds. You’ll need to rest until the anaesthetic has worn off. You may also need pain relief. On the first day, you may have to wear special pads attached to an intermittent compression pump on your lower legs. The pump inflates and deflates the pads and boosts the blood flow in your legs, helping to prevent deep vein thrombosis (DVT). You’ll need to wear compression stockings to help boost your circulation and continue to have injections of anti-clotting medicine. You’ll be encouraged to get out of bed and move around as soon as you can. This helps to prevent both chest infections and blood clots developing in your legs. You may have a nasogastric tube (a tube inserted into your nose that goes down to your stomach) to keep your stomach pouch empty. This is usually taken out the following day. You’ll have a drip put into a vein in your hand or arm to give you fluids. If you feel well enough, you can start to drink small amounts of water soon after your operation, and the drip will be removed. You’ll usually be able to go home one to three days after your operation. You’ll need to arrange for someone to drive you home. Your nurse will tell you how to care for your healing wounds before you go home and give you a date for a follow-up appointment. You may need pain relief for a few days after the operation. If your surgeon used dissolvable stitches, they’ll be under your skin so you won’t see them. If you have non-dissolvable stitches or clips, you’ll need to have them taken out. This is usually 7–10 days after the operation. Your surgeon will tell you when and where to have them removed. It will probably take you between four and six weeks to recover fully from a gastric bypass operation. During this time, you’ll notice weight loss and will probably need to carry on eating soft foods. This will vary from person to person, so talk to your surgeon about what’s right for you. After gastric bypass surgery, you’ll need to make major changes to your eating habits as your stomach will initially be around the size of an egg. You’ll only be able to eat small amounts at each meal – starting with liquids and purées, before moving on to solid food. Your surgeon or dietitian will give you all the information you need about which foods you can eat and how much. It’s essential that you make the recommended changes to your diet after surgery. But this may mean you don’t get enough protein or certain vitamins and minerals, which can affect your health. If you don’t get enough iron after gastric bypass surgery, this may cause anaemia. Your surgeon is likely to recommend you take vitamin and mineral supplements, including folic acid and calcium. You may also need to have regular injections of vitamin B12. You’ll need to have regular blood tests to check you’re getting all of the vitamins, minerals and nutrients you need. You’ll also be asked to make other changes to your lifestyle, such as being more active and keeping the amount of alcohol you drink to a minimum. These changes will help you to get the most from your gastric bypass operation, so you can lose excess weight and keep it off. Being physically active will also help to tone your muscles and improve your posture. Losing weight after a gastric bypass is usually a positive thing. But some people find it hard to adapt to their lifestyle changes and appearance after the operation. Talk to your GP or surgeon if you’re struggling to cope, or are worried about something, as they’ll be able to suggest ways to help. Your doctor may also suggest a patient support group, where you can get support and advice from other people who have been through the operation too. You’re likely to have some bruising, pain and swelling of the skin around your wounds after a gastric bypass. But this shouldn’t last too long. You may feel sick, or even be sick after eating. This is because after surgery you’re only able to eat a small amount of food at a time. This should get better as you change your eating habits. After your surgery, you can get an unpleasant sensation called dumping if you eat too many sugary foods. This can make you feel sick or faint, or give you tummy pain and diarrhoea. You can reduce dumping by eating small amounts of food more regularly, eating less sugar and resting for an hour after your meals. See the FAQ on What is dumping? below for more information. After any surgery, you may have some complications, including a reaction to the anaesthetic and blood clots in your legs (DVT) or lungs (pulmonary embolism). If you have other conditions linked to your weight, such as high blood pressure or diabetes, these can make you more prone to complications. After a gastric bypass, you may have some other complications too. You may develop an infection in your wound or a chest infection. You may get bleeding from a stomach ulcer. Ulcers are more common if you smoke, so you’ll be advised to stop. Your doctor may also suggest taking a type of medicine called a proton pump inhibitor to reduce the amount of acid in your stomach, and advise you to stop drinking alcohol. The join between your stomach pouch and small intestine can become narrower, making you feel sick and even be sick. You may get a leak where your intestine is re-joined to your stomach. This can be very serious and you’ll usually have an operation to repair it straightaway. If you lose weight quickly after your surgery, you may develop gallstones. These can be painful and you may need surgery to remove them. Your surgeon may suggest removing your gallbladder during your gastric bypass, or may prescribe medicines after your surgery, to stop this from happening. If you have tummy pain after your surgery, especially after three months or so, you may have developed an internal hernia. You won’t be able to see the hernia; it won’t be visible as a lump on your skin. It happens when one of the two bowel loops that have been created during surgery twists under the other through a newly created opening. The pain may spread from your tummy to your back. If the twisted bowel gets trapped in this position, it may get blocked or the blood supply to it may be cut off. If you develop an internal hernia, you’ll need more surgery to repair it. During your operation, your surgeon may find an unexpected problem and may need to switch the keyhole operation to an open procedure. This won’t affect how well the operation works, but it may take you longer to recover afterwards. Not everyone loses enough weight after gastric bypass surgery. The main reason for this is not following the rules about diet and exercise. What is dumping? What is dumping? Dumping can occur after gastric bypass surgery, caused by changes in the way your digestive system works. It can make you feel sweaty, sick and lightheaded. You may also have extreme tiredness, tummy pain and diarrhoea. You may notice dumping symptoms 30 minutes to an hour after eating (called early dumping) or within three hours (called late dumping). Early dumping is caused by your stomach emptying too quickly into your bowel. This causes liquids to be pulled from your blood and surrounding circulation into your bowel more quickly. The extra fluid in your bowel may make your tummy swell up. The loss of fluid from your circulation can cause your blood pressure to drop. With late dumping, your body may release too much of the hormone insulin, which can make your blood sugar fall too quickly. Dumping may get better over time. You can prevent it by eating the right foods and taking other simple precautions, including the following. Stick to small, regular meals that are low in carbohydrates (bread, potatoes and cereals). Avoid eating a high-sugar diet. Rest for up to an hour after eating until your symptoms go away. Eat only foods that are low in sugar, or use artificial sweeteners. Don’t drink anything during your meals or for half an hour afterwards. If you have symptoms of dumping, lie down until your symptoms have gone away. If you’re eating fewer carbohydrates, eat more protein and fat-rich foods to make sure you’re still getting enough energy from food. You may find that milk and dairy products upset your tummy if you’re prone to dumping syndrome, so try to avoid having these. Up to half of people who have a gastric bypass may have symptoms of dumping after their operation. But the symptoms are usually mild. If you’re worried about your symptoms or what you should be eating, ask your dietitian or doctor for advice. What can I eat after surgery? What can I eat after surgery? A gastric bypass operation makes your stomach smaller, so you’ll only be able to eat a little food at each meal. In the first month after your operation, you’ll need to eat small amounts of puréed foods, while your stomach is healing. After that, you can gradually start to eat solid foods. Eating healthy foods that are low in fat and sugar and high in protein will help you lose weight and keep it off. For the first week after your operation, you’ll only be able to drink water or other fluids. Fluids include skimmed milk, hot drinks such as tea and coffee, thin soups and fruit juices. For the next three weeks, your food should be puréed. This is because the opening out of your stomach will be quite swollen, and solid food won’t be able to pass through it. You may be given specific dietary advice, but the main rules to follow are listed below. Your food should be runny, like smooth baby food. Use a blender, masher or food processor. Adding extra liquid, such as gravy, sauces or fruit juice, can help to make your food smoother. At first, each meal should be no more than five or six tablespoons. Eat slowly and take small mouthfuls. As soon as you start to feel full, stop eating. The feeling of fullness after a gastric bypass may be different from the feeling you had before. A full stomach may give you a heavy or tight feeling in your chest. Make sure you drink enough water or fluids every day. You should drink 1.5 litres of fluid over the day (up to 200ml at one time). Drink between meals rather than when you’re eating, and don’t drink fizzy drinks. After the first four weeks, you can gradually start eating foods that are lumpier, but make sure you chew every mouthful well. In the long term, you’re aiming to eat a healthy, balanced diet. This will help you to keep losing weight and to get all the nutrients and energy you need. Make sure you eat three, evenly spaced and balanced meals throughout the day. Eat slowly and stop when you feel full. Try not to drink anything in the half hour before your meals or for an hour afterwards as the fluid will make you feel full. Make sure you eat enough protein such as meat, fish, pulses and eggs, and only small amounts of carbohydrate such as potatoes, pasta, rice and bread. You’ll need to reduce your portions of pasta and rice as they take on extra water in your stomach and swell. You should eat four to five portions of fruit and vegetables a day. Choose low-fat foods, such as skimmed milk and low-fat cheese. Don’t eat foods that contain a lot of sugar. This can cause dumping, which can make you feel sick and cause other unpleasant symptoms. See What is dumping? above. Doughy white bread and red meats (if not minced) are often the most difficult foods to eat early on. It can take months after your operation to learn which foods you can eat, and to feel confident and comfortable eating. There may be days when you feel sick after food and other days when you don’t. Your intolerance to certain foods may change over time, so don’t be afraid to revisit them at a later date. Talk to your surgeon or dietitian about the foods you can eat after your gastric bypass. Can I have excess skin removed? Can I have excess skin removed? Losing a lot of weight can make your skin loose, leaving you with folds of excess skin. You’re most likely to notice this on your tummy, face, bottom, breasts, upper arms and thighs. This can be uncomfortable and embarrassing, and the skin in these areas can also become irritated, painful or infected. Cosmetic surgery can help reshape the parts of your body where you have extra skin. It’s usual to wait for at least 12 months (often longer) after your operation before having any cosmetic surgery. This is to make sure your weight is stable and isn’t likely to change significantly. Cosmetic surgery isn’t right for everyone and can cause more health problems. Surgery purely for cosmetic reasons (to improve your appearance) is only available privately. If you want to find out more about cosmetic surgery after your gastric bypass, speak to your doctor. See Tummy tuck (abdominoplasty). Gastric band surgery is a common type of weight loss (bariatric) surgery for people who are very overweight (obese).